Exceptional cuisine, delightful and atmospheric hotels add to the ambiance of this country that is both sophisticated and quietly elegant with just a touch of French savoire faire blended in with the mystique of a land of desert and mountains people. 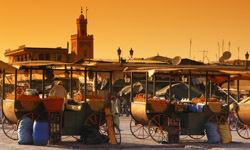 In Marrakech there’ll be a day at leisure and more tempting markets beckon. Arrive in the coastal city of Casablanca where you will be met and transferred to your hotel for an overnight stay. Following breakfast, begin a tour of this important and wealthiest city in Morocco. Drive through the United Nations Square and past the outside of Hassan ll Mosque with its 600ft high minaret, the tallest in the world. Also visit the Central Market, the more modern Habous Quarter and then the beautiful Ain Diab Corniche whose beaches and beach clubs overlook the Atlantic Ocean. The evening is at leisure with dinner at the hotel. Set off after breakfast for Fes stopping in Rabat and Meknes en route. Rabat, the country’s capital has impressive buildings such as the Hassan Tower, the Mohamed V Mausoleum and the atmospheric Casbah of Oudayas. Next visit Meknes, a walled city renowned for its Moorish architecture, particularly the gate of Bab El Mansour, the palace complex of Dar El Beida and the Moulay Ismail Stables. Arrive in the early evening in Fes where you will spend the next 2 nights. The day is devoted to touring this fascinating and ancient city. Within its walls and beyond the great entrance gate of Bab Boujloud awaits tiny alleyways in the souks (markets), mosques, fountains, historic study halls and palaces. Visit a leather tannery as well as a carpet co-operative and much more. Today’s journey of approximately 7 hours will take you south through the wonderful Moroccan countryside with the ever-present Atlas Mountains as part of the scenery. En route stop at Beni Mellal where you can have lunch and visit a 17th Century market. Continue on to Marrakech where you will spend the next 3 nights. Spend the day touring beautiful Marrakech surrounded by pink sand-stone walls and with the High Atlas Mountains making a dramatic backdrop. Visit the exquisite Majorelle Garden full of rare plants. Next see the towering Koutoubia Minaret followed by a tour of the mausoleums for Morocco’s sultans, the Saadien Tombs. Visit the Bahia Palace and the Dar Si Said Museum Palace full of Berber artificts. After a stop for lunch, spend the afternoon walking around Djemaa El Fna, a massive square that is the heart and soul of Marrakech. Today is a full day at leisure to relax, explore more of the city on your own or do some shopping in Marrakech’s many markets. Early breakfast and checkout of your hotel. You will be transferred to the airport to board your onward flight.